Original Editors - Lindsey Roederer and Stephanie McCauley from Bellarmine University's Pathophysiology of Complex Patient Problems project. Inguinal hernias occur when soft tissue, usually intestines, protrudes from the abdominal cavity. 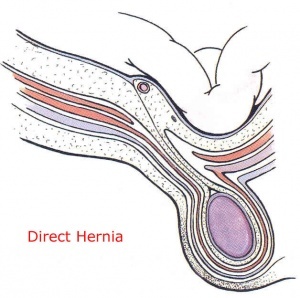 There are two types of inguinal hernias that occur in the groin region - direct and indirect. A direct hernia occurs when a portion of the intestine protrudes directly outward through a weak point in the abdominal wall. This weak point could be caused by a deficiency in the number of transversus abdominus aponeurotic fibers. 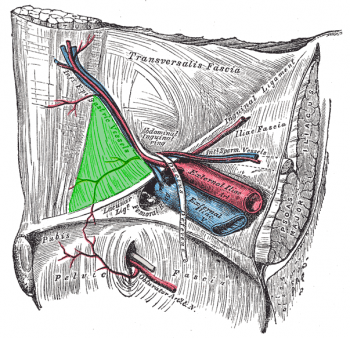 The inguinal triangle (Hesselbach's triangle) is a common location for direct hernias to occur. A direct inguinal hernia leaves the abdominal cavity medial to the inferior epigastric vessels. An indirect hernia occurs when a portion of the intestine pushes downward through the deep inguinal ring into the inguinal canal where the testes descend into the scrotum before birth (males) or to the labia (females)  An indirect inguinal hernia leaves the abdominal cavity lateral to the inferior epigastric vessels. In the United States, over 1 million abdominal hernia repairs are performed each year. Of those 1 million repairs, it is estimated that 770,000 of them are inguinal hernia repairs. Males receive 90% of all inguinal hernia repairs. Inguinal hernias tend to be more noticeable following a heavy meal or after standing for a prolonged period of time. The pain associated with an inguinal hernia is usually sharp and localized. It can be heightened by changes in position, physical exertion, and with any activity causing the Valsalva maneuver. It is typically located superior to the inguinal ligament, but behind and through the inguinal ring. It rarely enters the scrotum. The contained sac protrudes through the deep inguinal ring. The tissue can remain in the canal or pass into the scrotum (men) or labia (women). Antibiotics are prescribed for strangulated hernias if ischemic bowel or infection is suspected. Over-the counter or prescribed medication for pain relief is utilized following surgical procedures. To diagnose an inguinal hernia, the doctor obtains a thorough medical history and conducts a physical examination. The patient will be asked to stand and/or cough as the doctor palpates the suspected hernia for movement. Typically, no diagnostic tests are necessary, but an ultrasound or CT scan may be utilized in some cases. Herniations can be caused by a multitude of factors. 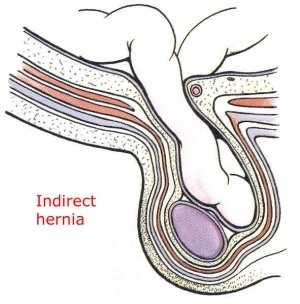 A direct inguinal hernia is caused by an acquired weakness such as obesity, pregnancy, muscle atrophy, chronic cough, ascites, heavy lifting, straining during bowel movements or urination, surgical incision, or blunt pressure from a trauma. An indirect inguinal hernia can be congenital or acquired. Gastrointestinal - In the case of an inguinal hernia, abdominal contents protrude through a defect in the fascia. An inguinal hernia can become incarcerated, in which a piece of intestine or fat becomes trapped in the hernia opening and an obstruction occurs. In a strangulated hernia, the blood supply gets cut off and a portion of the intestine may die. Symptoms of a strangulated hernia or intestinal obstruction include pain, nausea, vomiting, inability to flatulate or have a bowel movement, fever, chills, and/or abdominal swelling. This is a medical emergency and requires immediate surgical treatment. Cardiovasular - In the case of surgical hernia repair, complications from surgical intervention may include cardiac arrest, cardiac arrythmias, damage to blood vessels, excessive bleeding, and formation of blood clots. Integumentary - Depending on the severity of protrusion, the various layers of the integumentary system may be affected. In this situation, typical presentation is redness and inflammation of the skin covering the hernia. Following inguinal hernia repair, wound management of the surgical incision is necessary to prevent infection and excessive scar tissue formation. Signs of infection include redness, swelling, pain, and discharge. Reproductive - A long-standing inguinal hernia may negatively affect the microstructure of the testis and spermatic tract. Pressure or protrusion into the scrotum interrupts the thermoregulatory process of the testis and disrupts the production of sperm. Herniorrhaphy (Open hernia repair) - Local or general anesthesia is administered. The surgeon makes an incision in the groin, moves the hernia back into the abdomen, and reinforces the muscle wall with stitches. Laparoscopy - General anesthesia is administered. The surgeon inserts a laparoscope in the lower abdomen and repairs the hernia using synthetic mesh. Typically, patients experience a shorter recovery time and fewer complications. Hernioplasty - The area of muscle weakness is reinforced with a synthetic mesh or screen to provide additional support. This method may be utilized in open or laparoscopic repairs. Medication is prescribed for pain management following surgery. Vigorous activity and heavy lifting are restricted for several weeks. Education - Physical therapists educate clients on work strategies, including body mechanics, proper breathing, and lifting techniques. By reducing strain and increased intraabdominal pressure, one may decrease the risk of developing a hernia or worsening an already existing hernia. Screening - Obtaining a thorough medical history and conducting a physical examination is critical in determining the need for potential referral to a physician for diagnosis of an inguinal hernia. To palpate for an inguinal hernia, place hand at the location of the inguinal canal, superior to inguinal ligament and just lateral to the scrotum. Have the patient strain down or cough in standing to feel for a palpable mass . Postoperative Rehabilitation - Often, patients are not seen for post-operative rehabilitation of an inguinal hernia repair. However, patients may require physical therapy services in order to return to prior level of function. A rehabilitation program will include posture exercises, education of proper body mechanics, and core strengthening. The program will be progressed as appropriate to include sport or work-specific functional activities. With inguinal hernias that present with minimal symptoms, it is acceptible to watch and wait instead of opting for surgical repair. Supports and trusses can be used as a short term option to contain the hernia and prevent it from increasing in size. Also, there are strapping techniques available to contain the hernia; however, they are not recommended for use because the tape could cause an ulceration of the skin covering the hernia. During the acute phase when the hernia is small in size, it can be reduced by pushing it back in place. A person could manually push it back into place using their hands. If swelling is an issue, one could place ice over the affected area prior to pushing the contents back into the abdominal cavity. Additionally, one could lie with their pelvis higher than their head to assist them in pushing it back in place. It is critical to differentiate between an inguinal hernia and other conditions that may present with similar signs and symptoms . ↑ 1.00 1.01 1.02 1.03 1.04 1.05 1.06 1.07 1.08 1.09 1.10 1.11 1.12 1.13 1.14 Goodman CC, Fuller KS, Pathology: Implications for the Physical Therapist. The Gastrointestinal System. Saunders, Elsevier Inc., 2009. p870-74. ↑ 2.0 2.1 Tank, PW, Grant's Dissector. The Abdomen. Lippincott, Williams, and Wilkins, 2013. p95-6. ↑ 6.0 6.1 Moore KL, et al, Essential Clinical Anatomy. Abdomen. Lippincott, Williams, and Wilkins, 2011. p134-5.